Containing both the study guide and DVD, this exploration of shame and freedom is made to help foster God-given purpose. 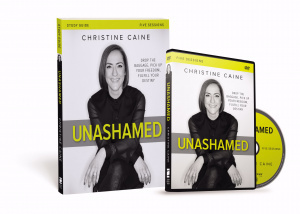 In this five-session video Bible study, author and teacher Christine Caine weaves examples from her life with those of biblical characters who failed but overcame their shame to show how God heals us and redeems us. In her passionate style, she explains that if we want to change our futures, we have to believe God is bigger than our mistakes, our inadequacies, our pasts, and our limitations. We have to believe God created us for a unique purpose, has a specific plan for us, and has a powerful destiny he wants us to fulfil. God has already won the victory over sin and its shame, and we do need to spend our lives believing the lies of the deceiver. Instead, we can allow ourselves to be defined by God's truth and choose to see ourselves the way God does--through the lens of his eternal perspective. So join the journey. Stop merely existing and start thriving. Lay hold of the power of Jesus Christ today and step into his future--a beautiful, full, life-giving future filled with purpose. You can live unashamed! Unashamed Study Guide with DVD by Christine Caine was published by Zondervan in May 2016 and is our 24579th best seller. The ISBN for Unashamed Study Guide with DVD is 9780310698760. Be the first to review Unashamed Study Guide with DVD! Got a question? No problem! Just click here to ask us about Unashamed Study Guide with DVD.